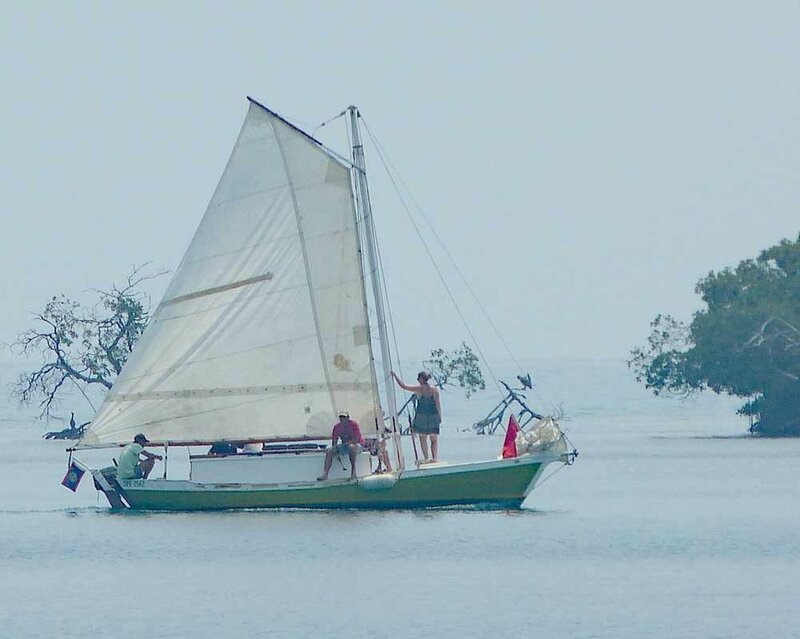 Moorings gave us prescribed courses in and out of the Pelican Cayes and Blue Ground Range. And it's a good thing! This was probably the trickiest section of the trip, and after a false start, retraced our way points out of our sheltered moorage at Hideaway Caye. Then turned north, back into the main channel. Our way points took us through the Blue Ground Range of Cayes, with tiny coral outcroppings and shallow areas visible in the bright sun! 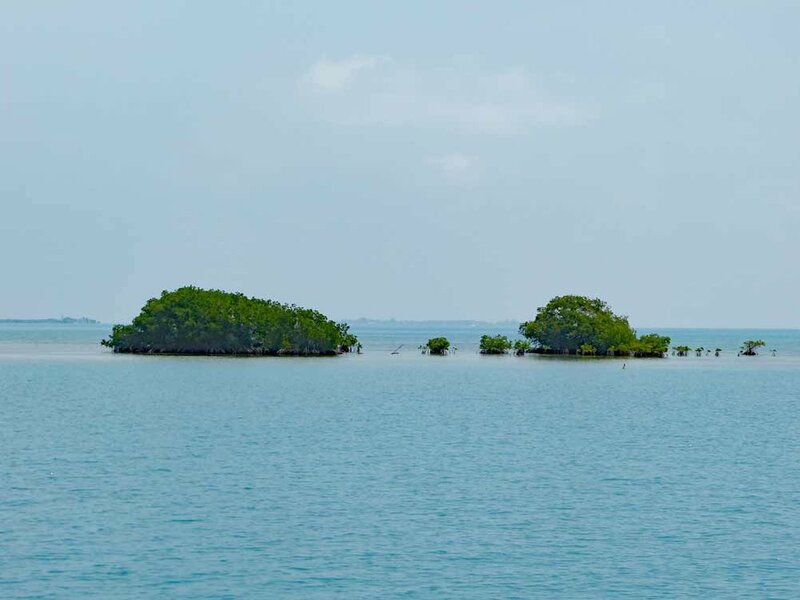 Many of these are private islands and the development on them ranges from flimsy fishing shacks, to elaborate resorts and everything in between. Through the first section, with some beautiful buildings close by to port and a fishing shack off to starboard, we kept watching for an area that was marked as "dry!" With only an 18" tide, this area could be covered during a high tide, but we did pick it out and our way point put us right in the correct spot where we made a sharp right turn towards South Water Caye, our planned overnight stop. South Water was just a blip on the horizon as we navigated through a couple of really, really narrow and shallow areas, our lookouts on the bow scanning the water ahead as Betsy and I watched the depth sounder in the steering station. But it seemed we were the only ones on this course, as local pangas and fishing boats went full speed across what appeared to be shallows and full of coral heads! Local knowledge! South Water is part of the South Water Caye Marine Reserve, the largest Marine Reserve in Belize, encompassing 117,878 acres and is part of the Belize Barrier Reef System World Heritage site established in 1996. It's a popular Caye with three resorts and several mooring buoys and we approached hoping for a hook-up! Unfortunately, all the mooring were taken but not to be discouraged, we made the perfect anchor set! Right on the edge of the sand, almost in the sea grass, plenty of chain and we were solidly there. Just to the south of the cut, the break in the reef, lies Carrie Bow Caye, the Smithsonian's base for the Tenenbaum Marine Obervatories Network and of particular interest to our two NOAA crew members who dinghied over for a visit. As we hadn't made reservations for dinner, I tried calling on the VHF to the two resorts that purportedly served dinner, but with no luck. Tina, who was out kayaking went ashore and discovered that The Blue Marlin had just hosted a large group and was out of food except for pork chops! And so she made a reservation at Pelican Beach where our choice was Tumeric shrimp or Tumeric shrimp! So guess what my birthday dinner was? Right! Of course, no one needed an excuse for a party, but seeing as it was my birthday, Jane had planned for the fun and brought out a whole lot of decorations, including a transparent air mat, or as we used to call them, a li-lo that lit up with colored LED lights! How she got everything into her bag, I have no idea! Bubbly appeared and the celebration began, with a ride to shore for dinner. The meal was delicious and our charming waitresses treated us to some special, local fruit wine and a little birthday desert! It probably wouldn't have mattered what they had served, it was such a fun evening onshore which culminated with all nine of us dancing! Back to boat and once again, seeing as it was my birthday, it was time to test out the birthday suits! Over we went, in the dark, with the lit air mattress sparkling in the night. We almost lost Jane as she swam into the darkness, chasing the all-important $1.99 (also LED lit) beach ball, the gently drifted away! But being the strong swimmer that she is, the ball was captured and returned! It's been years since I went skinny dipping, I think the last time was in the British Virgin Islands! I do love the freedom and I definitely plan to do it more often.